The high-rise construction boom in Toronto has been evident for a while. It has been motivated by sky-high prices. In May, prices in Toronto rose another 5% from a year ago. For all types of homes, prices are now 42% higher than at the crazy peak of the prior bubble! And if people can’t afford to buy any longer, even with super-low interest rates, well, they can step down to a fancily equipped micro-condo, or more commonly called shoebox condo, where the dining table might fold into a bed. National Bank Financial said in a note to its clients that, based on data from Canada Mortgage and Housing Corp., the number of completed but unsold condos in Toronto spiked in May to 2,837, an all-time record high. So the monthly data is choppy and may not be very reliable. It’s an estimate, and estimating new and unsold condos isn’t that easy. 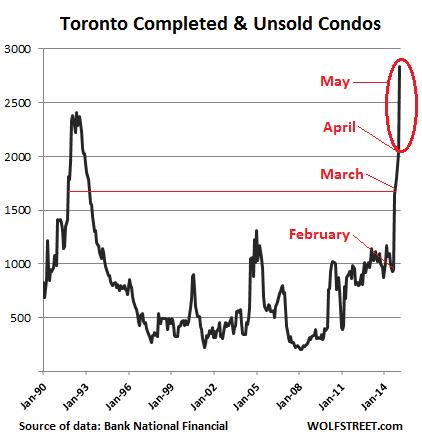 But the magnitude of this spike far exceeds the monthly ups and downs in recent years, and exceeds even those dizzying spikes in the late 1980s and early 1990s when the Toronto condo market went completely haywire. The report blamed the absorption rate, a measure of condos that have been completed during the month and were either sold or rented. It plunged to 69.5%. But don’t worry. “It would be premature to think that the absorption rate will stay low, causing persisting accelerated increases in the number of vacant completed condos,” the note said to mollify client anxieties. Such a spike in unsold units and such a plunge in the absorption rate would normally get folks to fret about oversupply, future pricing pressures, and other industry nightmares. Condo construction booms have a nasty tendency to flip suddenly into busts, and then no one can turn off the spigot of new units coming on the market because high-rise condos take years to plan and build, and they just keep coming. To be sure, the situation deserves monitoring. But one month does not make a trend. According to more comprehensive data from Realnet (it includes presales and condos under construction as well as completed condos), the number of unsold new condos has been trending down since the second half of 2014. Canada Mortgage and Housing Corporation (CMHC), an entity of the Canadian government, just released the housing starts data. In the Toronto Census Metropolitan Area, starts of single-family detached homes edged up 6% year-to-date through May to 3,121 units. Starts of “all others,” a category that consists largely of condos in Toronto, jumped 29% year-to-date to 13,384 units. But in May alone, compared to last year, “all others” soared 80%! That’s the true signature of a condo construction boom. Now all we need for this condo market to remain “well-behaved,” despite soaring starts and unsold inventories, is for a lot of buyers with a lot of money to emerge very quickly from China or wherever and “absorb” these units and all the units still coming on the market. Or else, this is going to turn into one epic condo glut. ← What Does California Gov. Jerry Brown Know about the Next Crash and Recession that We Don’t? There is a lot of Bleating about down under property Bubbles in the Anzac Nations. This is evidence of a condo Glut, in Toronto and probably other Canadian city’s. Condo Gluts tend to be much scarier, taking out big corporate developers, not just wage earning single unit mortgagers. With large volumes of associated commercial financial damage. Lot’s of new buildings being planned for the CBD area. Used to be cheap and during the last oversupply/glut you couldn’t even get people to rent them. I wouldn’t buy one of these things even at a 1/4 of the current price. Yes, one would almost think it was a historical article, not the present day. 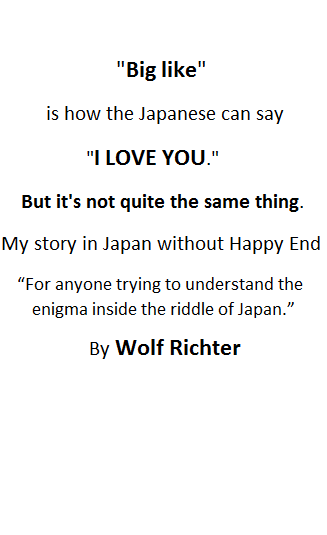 Ending will be the same as last time. Most of them will be vendor financed. and his mates all over Again. Run, very far, and fast, and keep you wallet firmly closed, and very well hidden, at all times. The only people who may benefit from this is those who would otherwise rent for ever and can make the payments, as over their lives, they may build a small amount of equity for their grandchildren. Interesting article in today’s on Houston housing market. it seems to be all high end sales. This is happening in a lot of places/countrys. Cash glut looking for returns or havens? People who dont have the tax liability’s like the corporates to write off all the potential losses getting out of Paper? Particularly in America O bummers anti business policy’s have killed any incentive to invest in anything productive in the US. What does the 96 -99% do when it wants out of paper and many munis are now a medium to long term untenable risk? 96 – 99 is unclear. What does the 3% below the 1 % do. Whatever they are told to do. Has the Canadian Central Bank done any QE yet? If that’s the case, then they could just buy real estate so that taxpayers can “profit”, after all taxpayers get hurt if the bubble crash. When it’s a matter of national security, all options will need to be considered. Sooner or later the Feds around the world will have to raise rates to mop up all the excesses from QEs. Ugly scenario. No they have to inflate, or grow it away. When they raise, Govt costs raise, and safe haven seeking money will flood into bank deposits as there is no work for it other than high risk. These property issues at the top of the market are driven by cash looking for a safe haven/return. Look at how much cash the banks have in the CB’S/FED at the moment, as they have no work for it. Europe and Asia are now doing large QE, and china is doing huge discrete QE, it just created a huge Govt guaranteed muni market to hide the muni insolvency’s in china. If the fed raises, that money will race straight into the fed, the US $ will go through the roof, tanking both the US, and the Global semi stable Economy’s. Europe Asia and the US have to raise together, it is the only way to maintain stability. You can guarantee china will not play nice in this necessary maneuver. This is why they need more inflation, the sector that is not inflating holding everything back, is wages, due to illegal immigration to the west. Immigration EU legal and general illegal is killing the UK. There are more illegal and Economic migrants in the UK, than their are native unemployed, native to the UK for more than 3 generations. America with real under/unemployment close to 20% is still accepting millions of unskilled illegals and letting tech skilled immigrants undercut the American tech workers, stealing their job. The FED’S/CBS are doing one thing, and the immigration authority’s with O bummer Policy’s are killing it by allowing the illegals. To many have nots, are a bigger problem than not enough, and the answer is NOT, Tax the Rich. If I understand you correctly, you see interest rates and inflation going higher together ? And the $US as well ? I dont see them going that way. I am saying they NEED to go that way. With interest rates returning to their roll of a major tool controlling/cooling inflation. Currently savers and payers, are being punished, and bad debtors rewarded, with bankruptcy relief. At the very least savings should keep pace with inflation. This global glut of cash has to be soaked up, by other than housing and bubble paper. This will take a long time. Also not simply shoved into the fed to earn interest,which is what the banks will do with it, when the fed raises. Corporations have globalized, FED/Central banks have to do the same with their policy’s. This is why legarde/IMF, is against the current fed rate rise talk, when EZ and ASIA are still in QE. Another issue with raising rates at the wrong time in the US is stagflation, driven by interest rates, not wages, and demand. A situation easily created. Look at AU and NZ Flooded with foreign cash and property bubbles as they have developed trustworthy economy’s and higher than US EZ interest rates. AU and NZ have been through this before, raise rates to control property bubbles, and end up with more foreign cash forcing other bubbles. Put restrictions on foreign property investment/speculation, and get strife from the US and WTO. NZ had a SUB prime loan crisis that did not effect its banks or the state. Simply large private sector entity’s, glutted with foreign cash, trying to put it to work, in US style NINJA loans, and vendor financing. When it crashed a lot of money evaporated, very little of that money belonged to NZ citizens. $ US Is back to about where it belongs compared to the AU and NZ $. Eur, Sterling, Yen, are what have to rise against $ US with Yaun rising in a big way. Yuan is currently at the very bottom of where it should be against the $ US. Further rise in $ US from here are going to start making problems in a lot of places in and out of the US without comparable rises in the other majors against it. On a positive note I believe we have seen the last of the Major US manufacturing job, Outsourcing, and the scaremongering over TPP is just that. The big job issue for the US now is unskilled immigration along with tech job rate undercutting from Indian skilled medium term immigrants (Who mostly turn into long term although they are not supposed to). To get good inflation, you need wage growth, at the bottom, and currently the immigrants are preventing that. As they keep topping up the unskilled/semi skilled glut. Reinforcing unemployment and under employment of existing skilled workers, who because of them cant even get part-time McJobs. Driving these unemployed skilled workers, who don’t show on OFFICIAL unemployment stats, completely out of work participation. O bummer wants more longterm democratic voter’s, he is doing what he wants, to buy them, with immigration, not what America needs, on immigration, prolonging the, cash glut, stagnant economy, crisis, in the process. d- What cash? If there really was all this “money” available as cash, the problem would be sorting itself (velocity of money and all that). Instead, it’s all in digits, and the banks get first dibs on it, thereby pumping the assets they own (stawks, primarily) while the inflationary effects act excessively on wage earners. By the way sumthin, there’s plenty of wage growth . . . for managers. At least, not until it has been doubly seasonally adjusted. This is just part of one of our most serious issues: massive overcapacity in each and every sector. Back in the days when TPS still meant something, I took a course which used as one of textbooks Jeffrey K. Liker’s The Toyota Way. Principle #3 literally reads “Use pull systems to avoid overproduction”. As proof of the soundness of this principle, Liker compared how many unsold cars Toyota had at any given moment and how much unsold stock was rotting away near factories run by GM and VAG. TPS may not mean much today in a world that’s again dominated by old fashioned mass-manufacturing, but the warnings Toyota elders like Fujo Cho and Taiichi Ohno gave about overproduction in the 60’s and 70’s ring truer than ever. That any business will manufacture more than can be sold, is absolutely natural and to be expected. But when businesses or, even worse, whole industries grossly overestimate future sales and start manufacturing/building far more than customers can purchase, you have a serious problem. Usual market mechanism in these situations is liquidation: prices on unsold stocks have to be slashed until you find buyers willing to take goods out of your hands and what for a reason or another cannot be sold must be written off as a loss. Overcapacity must be eliminated at all costs. Investors will demand to know what went wrong and probably a head or two will have to roll. Caution about unrealistic sales and production figures becomes the norm. But these market mechanisms today mean absolutely nothing. The lesson the 2008 madness gave people was terrifying in its implications: liquidation must never come because deflating asset prices are “bad for the economy”. We must always have rising prices, regardless of demand, because a little constant inflation is good for the economy. If you cannot make sense of such dangerous drivel, welcome to the club. Sure, common sense dictates those unsold condos in Toronto must go down in price, perhaps a long way, until buyers will come. But that would imply, gasp!, asset deflation. Nobody wants to hear about deflating prices these days, except for those unwashed rustics still clinging to outdated notions such as “balance between demand and supply” and “price discovery” and old crones still paying attention to the price of tomatoes and bananas. But here’s the kicker: despite strenuous and even moving efforts to keep asset values in the stratosphere, market dynamics have already started to work. Commodities have cratered in spite of enormous sums poured into keeping them artificially inflated: sooner or later yuppies will have to liquidate their oil futures at a loss unless they want some OPEC member with a twisted sense of humor to dump 400000 barrels of Dubai Crude in their pools. China is too busy playing the stock market to be bothered with buying more commodities. So far swooning commodity prices haven’t translated into lower consumer prices: CEO’s and CFO’s want to squeeze every single nickel out of customers both because they refuse to see the mountains of unsold stocks building up and because they need to keep on reporting suspiciously sounding profits to keep stock valuations going higher and higher. In the end, it’s a losing game: somebody will have to blink first. Consumers are showing signs of strain all over the world. Purchases won’t crater all of a sudden, but are slowly contracting. A 1% increase in value these days really means a 1-2% contraction when unreported inflation is factored in. The pie is steadily shrinking for everybody. Somebody will be tempted to slash prices to entice more consumers to shift their preferences. And that unsold stock… be them condos in Toronto or cars rotting away under the Spanish sun, it’s the symptom the market can only take in so many goods but manufacturers are failing to adapt. Automotive CEO’s are back at promising totally unrealistic sales figures like they did in 2003 and 2007. Unbelievably, they are often exactly the same persons: in other days investors and board members would have chased them down the road with pitchforks when junk auto loans cratered in 2008 but these days accountability has gone the way of the dodo. But sooner than later somebody will have to eat those losses, and it won’t be exasperated consumers. They will simply close their wallets and refuse to overpay. Their message will be short and to the point: “Slash prices or else”. It remains to be seen how governments, the biggest lovers of inflating prices always, will react. In seven years they shot most of their ammo to keep asset prices at unsustainable levels. All that’s left in their arsenals, very much like in the Time Lords’ at the end of The Great Time War (excuse me for being a big Doctor Who fan) are blunt weapons of mass destruction. Will they be so stupid as to use them or, like JFK and Khrushchev, will they back down? In the Deep South we have been seeing foreclosed single family units put up for “auction” by the banks. I put auction in quotes because, when you read the fine print, the main ‘auction houses’ usually Hubzu.com or Auction.com, reserve the right to make ‘counter bids’ on behalf of the seller. So, the house bids the price up to the banks break even price, always. Most of these exercises in “price discovery” end up as pointless wastes of investors, or hopeful lower level proto homeowners time. After several such cycles, the house then gets listed for sale, usually at the banks profit sweet spot. After that, the banks have been very reluctant to lower prices. No one so far wants to break the logjam and admit to losses on their portfolio. Until the bank execs are bought to account over their control frauds, nothing will change. In a lot of country’s it is highly illegal to do that in a forced sale. A lot of the playing fields in America really need leveling. Commodity prices aren’t slumping “in spite of enormous sums poured into keeping them artificially inflated”, commodity prices are being artificially depressed. Consumers are showing signs of strain, but the response in the modern world isn’t lowering prices, it’s expanding credit, even to people you know will never pay. If there were any real money to be squeezed from consumers, stocks buybacks wouldn’t be so popular (just look at EPS misses that send many stocks HIGHER). Consumer spending has been dead for over 7 seven years now; it’s not going to be the catalyst for a collapse. In Florida the condo associations have been buying the foreclosures and renting them out. They do this in order to keep the “market” prices high. The problem is that reserves and maintenance revenues are being used and assessed to subsidize all those renters. The buildings may be full but with what? In other countries those entity’s can sometimes morph into social housing providers. moving the freeholders to their other buildings and creating what eventually becomes Detroit ghettos, writing off their losses against TAXES. Not always a happy picture for many of the cheaper freehold unit holders in those buildings. The spike correlates closely to the completion of the Toronto summer Pan-am games athletes village. 1300 condo units have been built which will house 10,000 athletes this summer. The plan is to finish the units and sell them after. Here’s an article claiming that many of the units are already sold according to a RE agent. If the chart is correct, the data paints a very different picture. 1. Many of the units for the athletes have already been sold: 90% in one building and 60% in another (so they’re no longer in the unsold inventory). So, from the article, it seems almost none of the units are in the “unsold inventory” and therefore almost none are part of the spike of unsold inventory. That was done on purpose, as the article explains, because they didn’t want to dump these 1,300 units on the condo market after the games, with damaged interiors and all. They’d planned ahead. It probably took years to arrange all this. I’d say good planning! I don’t disagree with you. I’m very suspicious of the data with such a huge spike in it. We can’t even get employment data right here in Canada. Building rules here require 60% of the building be sold before ground can be broken. So using last years completion of 25k, that means that 10k could have been unsold at the start of building. With those numbers it certainly is possible, but it would mean there are quite a few new buildings that were completed with ownership close to the minimum threshold. The power of foreign money is huge here. I’ve seen it all around Toronto. I think it’s causing a bubble and definitely believe that condo developers have swamped the market with record deliveries. Ultimately, the question in my mind is whether a depressed c$ can act as a pressure valve and bring additional foreign capital in to save the day. When big money in other places hits similar rules, They simply create straw rental company buyers to breach the threshold and then re-sell. Regulators dont look too hard for the real stock holder behind the 60%. In some city’s huge profits are made flipping units before the ground is broken, let alone by half built. Some entity’s specialise in that activity. Rules like that 60% one, only protect the innocent, from the honest. Chinese or wall street speculators, and honesty?????? “you mean more foreign Capital can be sucked in to stave off the crash created by the first speculators flood of foreign capital, letting the first tier speculators out a a profit, No? Another driver of these gluts is that they are building to the upper mid range of the market, to ensure a good return, when the demand is at the BOTTOM, with much lower margins. State intervention at the planning stage demanding a percentage be sold to 1St time Bottom tier buyers at true unit cos,t as opposed to unit % of total building cost, would be a wise move.